A soft breeze is blowing over the waters of St. John’s Bayou and the sun is lining the clouds in crimson and gold as a cluster of devotees from La Source Ancienne Ounfo help their Manbo Sallie Ann Glassman welcome friends and visitors to the annual celebration and headwashing ritual in honor of the most famous Voodoo priestess New Orleans has ever known, the celebrated Marie Laveau. 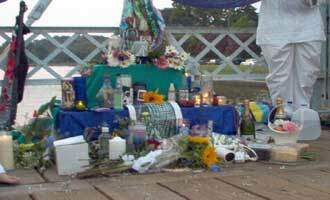 A tiered altar is set up against the railing on one side of the old foot bridge that has for years crossed the Bayou in front of Cabrini High School. The altar is decorated with candles, flowers, incense, food offerings and other items; a worn and obviously much-loved statue of Marie Laveau stands proudly on the highest tier. By the end of the ceremony, the statue will be almost entirely obscured by offerings too numerous to name, placed there by devotees of Voodoo and of the woman who made this island religion – and her hometown of New Orleans – famous for generations. Today, these devotees keep the religion alive by following in the footsteps and instructions of another powerful and charismatic Manbo, Sallie Ann Glassman. Sallie Ann is the founder of La Source Ancienne Ounfo, a private Vodou society that has served the Lwa (the voodoo spirits) and the New Orleans community for over 25 years. Manbo Sallie Ann and the Ounfo practice a unique and vibrant form of Vodou based upon the traditional Haitian beliefs but filled with, as Sallie Ann has said, “ongoing inspiration and innovation.” Sallie Ann and her extended vodoun family are at the heart of the genuine practice of vodou so often sought but seldom found by visitors to New Orleans. As the setting sun turns the sky to hues of pinks and purples Manbo Sallie Ann calls the group together to begin the ceremony. The sound of drums sets the mood and the Manbo, assisted by her dedicated Ounfo devotees, begins the dance that all hope will call the Lwa spirits to bless the ritual about to be conducted. In a ritualized celebration of the balance of power, Mambo deftly walks around a machete-wielding devotee to establish her authority to pass between the worlds of the physical and the unseen and bring the spirit of Marie Laveau forth. As the Manbo dances, a cantor’s beautiful voice calls out in Kreyol to “Papa Legba,” the great Lwa guardian of the crossroads who is invoked at the start of all vodoun rituals; without the help of Papa Legba, the doors between the worlds cannot be opened, or, once opened, closed again. 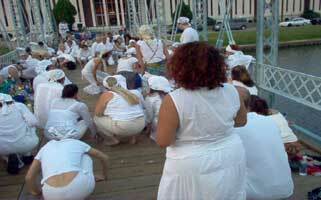 Between calls of “Legba” the devotees respond with “ayibobo,” the “amen” of Vodoun, as the ritual dance is completed. Now, as the drums continue, devotees follow after the Manbo, and hold symbolic offerings to the four corners of North, South, East and West, making a ritual cross before the altar. The candles are set to burn at each of the cardinal directions. 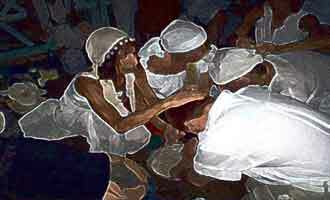 Manbo Sallie Ann now anoints the devotees and those gathered nearby with water from the altar and shakes over all a rattling gourd, or "shekke," meant to help the energy flow from each person into the spirit world. To further assist the spirits in the passage between the worlds, Manbo now brings forth from the altar a crystal container filled with cornmeal. In voodoo tradition, the Lwas have a voracious appetite for corn and are said to eagerly follow a trail of corn laid by devotees. 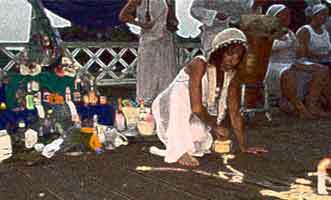 The Manbo kneels and with the cornmeal begins to draw on the ground; soon the squiggly lines begin to come together and can clearly be seen to form a “veve,” a mark or design associated with the spirit being called – this night, the spirit of the great Voodoo Queen Marie Laveau. 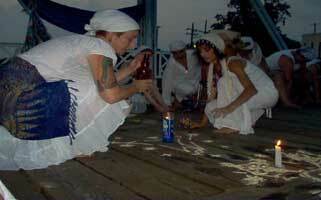 "Call on Marie Laveau for empowerment in the Vodou arts, and for help in healing. 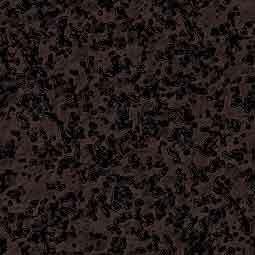 Marie Laveau provides assistance in all workings." --Manbo Sallie Ann Glassman from "Vodou Visions: An Encounter with Divine Mystery"
Soon the drums fall silent and the Manbo takes rum and incense from the altar. Kneeling beside the veve she anoints it first with the incense and then with the rum, spraying a mouthful over the veve. Now she is ready to call upon the spirit all have gathered for this night. 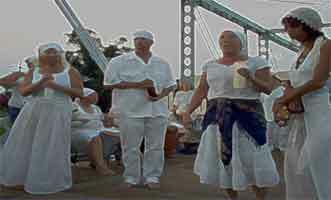 First, Manbo Sallie Ann again calls out to Papa Legba to gain his assistance in this most important part of the ritual. Her devotees respond in kind, calling out to Legba and following with shouts of “ayibobo.” Next, Sallie Ann calls upon Gede, the powerful Lwa spirit of the dead who is said to see in both worlds at once, and who is often represented as a skull wearing sunglasses with one lens broken out, symbolizing his unique duality. At the command of the Mambo, Papa Legba will open the way and Gede will guide the spirit of the great Voodoo Queen across the shadowy depths of the spirit realm. 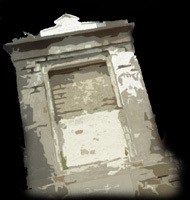 Haunted New Orleans Tours is following the experience of Reese, a famous New Orleans Psychic reader this evening, a newcomer to Vodoun who is attending his first vodoun ceremony. He watches with interest as Manbo and her devotees perform the ritual that will invoke the spirit of the mighty Voodoo Queen of New Orleans. He has come with friends, dressed appropriately in white clothing, and brought an offering in honor of Marie Laveau: hairdressing articles, a commemoration of Laveau’s “official” occupation in life. His anticipation and excitement has grown along with the timbre of the ceremony and now that Manbo Sallie Ann has reached the point in the ceremony where those in attendance can approach the altar to have their heads washed. Reese watches with curiosity as Mambo Sallie Ann and members of the Ounfo prepare the unique liquid to be used in this ceremony: a mysterious blend that includes fresh flowers, fruits such as strawberries and dates, and an entire coconut cake mashed into the brimming bowls. Together the Manbo and Reese rise to their feet and shake their clasped hands three times; the ritual is completed with a heartfelt hug from the powerful voodoo priestess. When all who desire it have had their heads washed, ritual gives way to celebration and dancing. 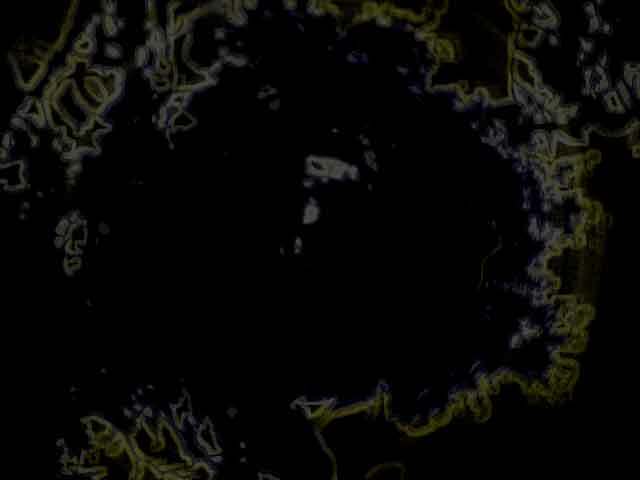 As the sound of the vodoun drums fill the humid air and the sky turns from shades of indigo to black overhead, the Manbo and the Ounfo lead the crowd in a weaving daisy chain back and forth upon the old bayou footbridge. Shouts of “aiyibobo!” echo over the drums and all are swept up in the rhythms. More than one devotee experienced possession this night, and one tall man strutted around wearing sunglasses, puffing a cigar and calling out for “RUM!” in a deep voice that sounded as if it came from somewhere far away. Some women who had arrived earlier that evening appearing prim and proper were now caught up in the drumming and the dancing: it was clear to even the most casual observer that there was truly a spirit present among these devotees. It is easy to believe that Marie Laveau herself was there, dancing with the Mambo and her followers in the heady New Orleans night. At the very least, this ceremony would certainly have made her proud. Manbo Sallie Ann Glassman and La Source Ancienne Ounfo perform the ritual headwashing in honor of Marie Laveau every year in conjunction with the traditional St. John’s Eve feast. 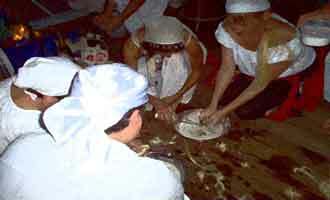 The ceremony and ritual are performed free of charge as a service and offering to the community. Attendees are asked to wear white in honor of Marie Laveau and to bring offerings to please the spirit of the great Voodoo Queen such as Manbo Sallie Ann instructs in the "Vodou Visions" book: "Salt water, white and blue flowers, white and blue candles, Voodoo doll, "Voodoo oil," gris-gris bags, jambalaya and other traditional Creole foods, hairdressing tools...Marie's Vodou Visions image." The Island of Salvation Botanica, LLC is owed by Manbo Sallie Ann Glassman. 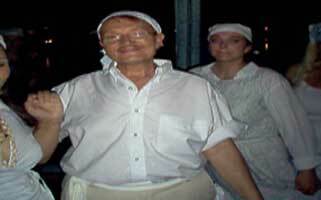 Since 1977, Sallie Ann has been practicing Vodou in New Orleans. 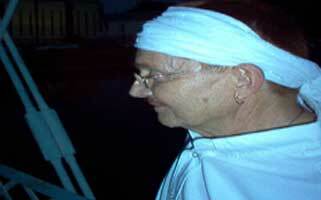 She was initiated as a Manbo in Port-au-Prince, Haiti, in 1995, by Oungans Edgar Jean-Louis and Silva Joseph. 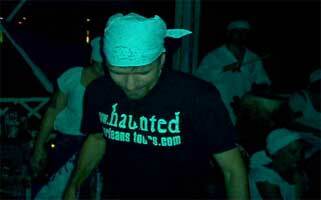 Your Haunted New Orleans ADVERTISEMENT could be here.